Work on biotensegrity started in the mid 1970s, when I was a young orthopedic surgeon trying to understand just what I was doing as a 'body mechanic'. Medical education and, even more particularly, surgical training, is probably the most anti-intellectual training experience outside of military combat training. Like combat situations, life and limb are at stake and there is no room for learning from your mistakes, but only from the mistakes of others. You are overloaded with facts, given little time to think, too much to do, and little time to do it in. Original thought and experimentation is discouraged and usually punished rather than rewarded. It is only afterward, after all exams are completed, can you begin to think for yourself. The wonder of it is that any of us do. Now that I am retired from clinical practice, I have time to do some thinking, I hope it is not too late. I was interested in spine mechanics, after all, I should know something about spine mechanics if I am operating on the spine. What I had been taught during my residency training, it was by some of the top biomechanics people at the time, was the application of first year college physics to biologic structures and particularly how it applied to the human frame. This has been, and continues to be, the accepted mechanics since first described by Borelli, a mathematician and 'renaissance man', in 1680, nothing has changed. This is all based on Newtonian mechanics as it would be applied to a column or building built with rigid materials and standing in one place on solid ground. But humans, and all biologic structures, are mobile, omnidirectional, gravity independent structures built of 'soft materials', foams, colloids and emulsions, (bone and wood are stiff foams, like styrofoam), and mechanicals laws as applied to these structures may be different. It is impossible to explain the mechanics of a dinosaurs neck using standard Newtonian mechanics. I live outside of Washington, DC, and, in the mid 1970s, I went to study the dinosaurs at the Smithsonian's Natural History Museum. I could not accept the Borellian model, but could find no other suitable model. 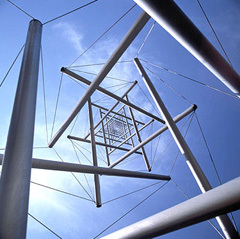 Siting on the mall in front of the museum, I looked across and remembered the Needle Tower, a Kenneth Snelson sculpture, right across the mall at the Hirshhorn Museum…and so began the rest of the story.